Offering you a complete choice of products which include briquetting plants, briquetting plant and biomass briquetting plant. Being a reputed briquetting plants manufacturer, we offer the latest technological briquetting plants at reasonable cost. 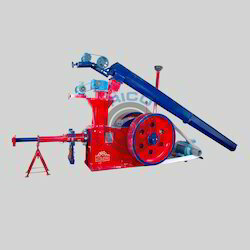 Our modern technique of manufacturing the bio coal briquettes is environment friendly as our briquetting plant machineries make briquettes without using the binder. We are the foremost exporter of the briquetting plant over the entire world. Our machines are designed with high quality that provides higher manufacturing efficiency as compared to other briquetting machines. That’s why we are the chief briquetting plant exporter in India. From all the manufacturing and exporting industries of the Biomass Briquetting Plant, the Radhe Group Rajkot is the topmost and reputed biomass briquetting plant exporter. We had exported more than 500 machines worldwide. Our briquetting plants working with agro and forestry waste and makes sustainable white coal briquettes that can be used as an industrial fuel. In India, Radhe Group Rajkot is versatile manufacturer and exporter of briquetting plant. We have successfully established many briquetting plants in India and other developing countries. Since 1991, we are providing the quality services in the field of the briquetting plant India, so our briquette plants are known as the Assured Briquetting plant India. We exports huge range of the briquetting plants and its equipments overall the world. So, we are the leading briquetting plants exporter in the world. Our latest method for manufacturing biomass briquetting plants makes us chief exporter of the briquetting plants in the world. Being the chief and respected biomass briquetting plant manufacturer in India, we offer our clients an excellence quality range of the briquetting plant. Our eco-friendly biomass briquetting plant offers the robust production capacity from 750 kg/hr to 1500 kg/hr.